Faster than DSL, unlimited service, that is what they claim. I asked about interference from storms, they said it didn't. They tried to sell me a larger package to improve pixels. I told them I didn't need more pixels as I didn't have an HD TV and my site isn't all that great anymore. They installed and the first day was okay. Second and every day after was a different story. Every day between 2 and 4 it went down and I had to hard boot the modem. I called the installer like he asked and he told me what to do. He said they were having satellite issues. I couldn't post anything to social media with the share button, I had to copy and paste right from the beginning. Less than a week later, I started buffering on my computer. I called and they said I had used up my limit, but I was told it was unlimited, that was one of the main reasons I switched. They told me they wouldn't cut me off or charge me more, but buffering all the time is not worth the cost of the service. I told them to cancel and this was less than 2 weeks of service, but today I got a bill for $344 as a cancellation fee. I do not feel I should have to pay for a service that was misrepresented. I feel this may be a Truth in Advertising issue. Slower than my DSL was, unreliable, and a total fabrication on the unlimited service. The sales rep that signed me up, out right lied to me. 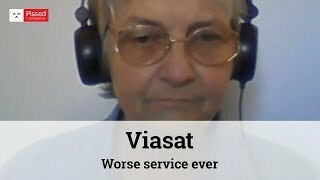 Viasat - Too damned expensive! I STARTED WITH EXECEDE AND THINGS HAVE GONE DOWN HILL EVER SINCE. I AM WEIGHING THE NEED FOR THIS SERVICE AT MY HOME. I AM OLDER AND LIVE ALONE SO I SPEND TO MUCH TIME JUST FOR THE NOISE. THIS COST FOR JUST STAYING INTOUCH IS NOT WORTH THE AGGREVATION AND COST. MAYBE OTHER OPTIONS ARE OUT THERE. I WILL FIND OUT OR DO WITHOUT. THE DIGITAL REVOLUTION IS FAST PRICING IT'S SELF OUT OF EVERYDAY USER REACH. WHEN THIS HAPPENS YOU SIMPLY CUT OFF THE SERVICE AND THEN READ A BOOK, WHICN I DID MOST OF MY LIFE ANYWAY. I have been with Viasat since it was Wildblue~when they were small, they were great, now that they are big and have expanded, the 5g speed with unlimited bandwith is slower than what I had before at half the price and limited bandwidth~I have the highest premium plan and pay 200.00 a mo under 2 yr contract~nights go down to almost dial-up speed, days are only a little faster~service tech adjusted dish slightly but no improvement~big rip-off! Viasat - Usually good fast service, but.. I pay for the gold service and it is in the 150kb download and the up load is slower, I call and they sent a service tech out stated something is not right the down load and upload speeds vary widely the tech said he would send a ticket to his supervisor. Heard nothing I called they said they saw a service tech was out but there was no note about what was going on. The always tell you turn on then off the modem then you have to connect computer with hardline to modem. I wish I had spectrum or another service where I live.